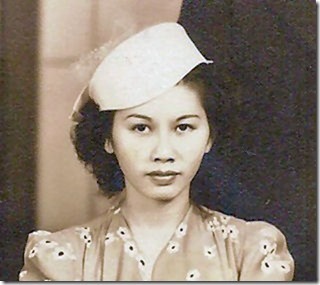 Gladys Sui Bun Young, my mother, was born on November 28, 1917, at home at 1071 Aala Street bordering Aala Park and across the river from Chinatown. Gladys was one of six girls born into the Young family. In their growing up years, I imagine they often played on Aala Street in front of their building. 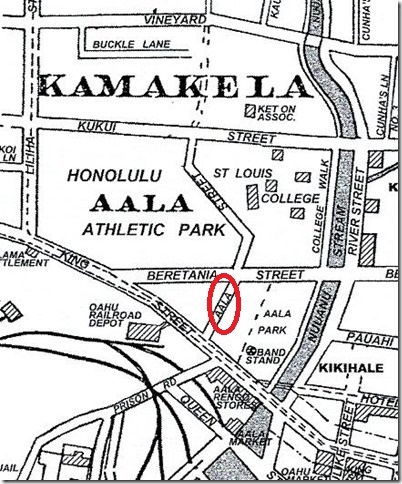 Today, this part of the street, between Beretania and King Streets, is no more (see the old map below), but sometimes I get the feeling that the spirits of the people who used to live there are still there. Aala Street in front of the building where my mother, Gladys Sui Bun Young, was born and raised. Today, this part of the street, between Beretania and King Streets, is no more. 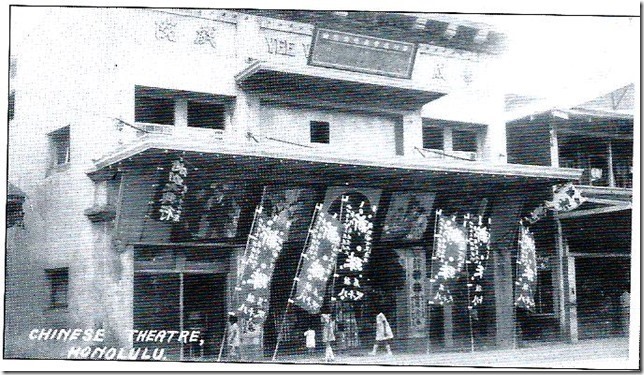 This Chinese theatre (photo below) on Aala Street, a few doors down from where little Gladys lived, was built in 1920. This Chinese theatre on Aala Street, a few doors down from where little Gladys lived, was built in 1920. Below is a picture of two kids standing in front of the theatre. The original caption says that these were two little boys, but I wondered if the kid on the left could be a girl, perhaps one of the Young girls. See the enlargement of the two kids. 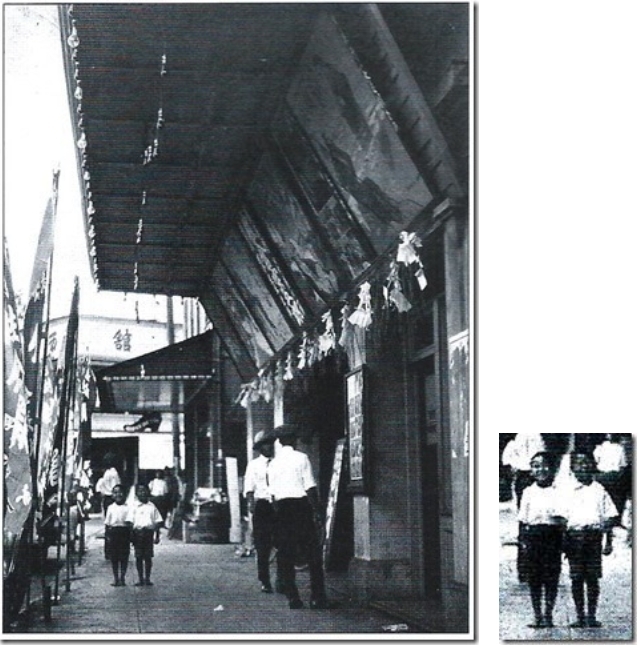 A picture of two kids standing in front of the Chinese theatre on Aala Street. I wondered if the kid on the left could be a girl, perhaps one of the Young girls. Gladys grew up to be a beautiful lady. The picture below was taken in 1940. Gladys Young grew up to be a beautiful lady. This picture was taken in 1940. The picture below was taken in 1966 when Gladys saw me off at the airport. 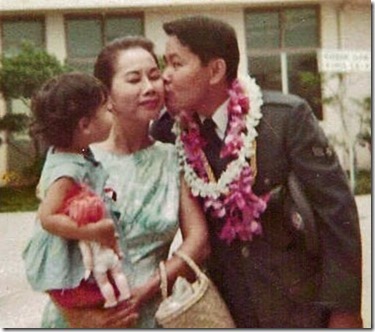 Gladys, in 1966, when she saw me, her son, Rodney Inefuku, off at the airport. Gladys Young passed away in 1974. I married in 1979 and had a daughter in 1982. A few nights ago, my wife, daughter, and I attended an Okinawan club dinner at the Okinawan Center in Waipio. The piano player played a few Okinawan songs beautifullly. One was “Tiinsugu Nu Hana.” I thought it sounded so much like the one below, which I had heard on YouTube. my heart is painted with the teachings of my parents. the teachings of my parents are not. I am guided by my parents who gave birth to me and watch over me. people who maintain their bodies will live life wonderfully. and as a result she will prosper. You can do anything if you try, but you can’t if you don’t. 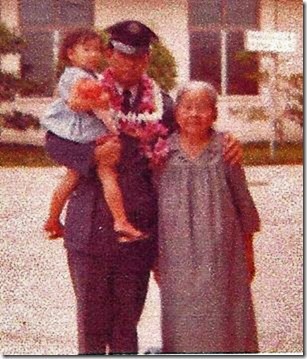 A photo of me and Baba, my Okinawan grandmother. She has been gone for over 40 years, but I still think of her often. At home the next day, she listened to the piano version of the song on YouTube and started figuring the song out on her electric piano. On a day in 1924 on Aala Street, a little girl named Gladys Young was playing with her sisters in front of their home. She stopped as she thought she heard a piano playing somewhere. “Do you hear that?” she asked her sisters. As she walked toward King Street, the impression of a tall building flickered on and off. The closer she got to the flickering image, the more pronounced and steady it became. Then it became real. The beautiful piano music became more distinct. It came from one of the apartments. Gladys found herself inside the apartment, standing in the doorway of a bedroom. She knew it was her granddaughter playing the piano. She stood there just watching and listening. Her granddaughter crinkled her eyebrows. She had the sensation that someone was watching from behind. It was a strange, warm feeling. She turned around to look but saw no one. She turned back to the piano, closed her eyes for a second, opened them, and took a deep breath. She then played “Tinsugu Nu Hana” again. This time with feeling and confidence. She and the piano felt like one. This entry was posted in Biography, Culture, History, Images, International. Bookmark the permalink. A beautiful story! I like your pictures. Thank you for sharing your family experiences.